Citizen scientists processed this image of Jupiter's cloud tops using data from NASA's Juno probe. Jupiter's twirling, swirling cloud tops look like a sheet of blue velvet in a new image from NASA's Juno probe. The image was created by citizen scientists Gerald Eichstädt and Seán Doran using raw data from the JunoCam instrument on Juno. While Jupiter's cloud tops wouldn't actually look blue to an observer hovering above the planet, the image processing allows our eyes to see the contours of Jupiter's turbulent atmosphere — details that aren't always visible in other images. Juno captured this snapshot on Dec. 16, 2017, when it was 8,292 miles (13,345 kilometers) — a little more than Earth's diameter — above the tops of Jupiter's clouds. The dark side of the planet just barely creeps into the image, in the upper-right corner. 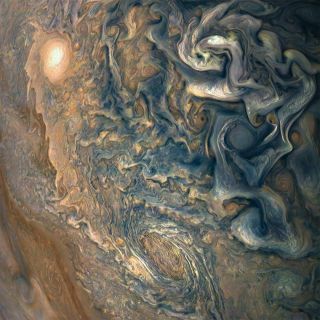 The raw images are posted to the JunoCam website, and many citizen scientists post their processed images, which range from scientific to highly artistic. You can see a selection of featured Jupiter images from citizen scientists on the JunoCam website. The $1.1 billion Juno spacecraft arrived at Jupiter in July 2016. The spacecraft's elongated orbit around Jupiter means it gets close to the planet only every 53 days. The spacecraft's instruments were designed primarily to study Jupiter's interior, which can help scientists learn about the planet's formation and the history of the solar system.